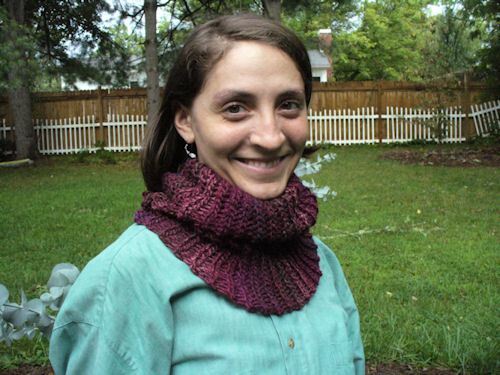 An easy one-skein project with great practicality for fall weather! The hat will keep your head warm, but if a cold wind comes up, you simply untie the top, and pull it down to cover ears and neck! When the sun comes out again, you can continue to wear as a neck warmer or pull back up into hat position in a snap. This simple project is a great introduction to the technique of Slip Stitch Crochet, which yields a very soft and stretchy fabric, resembling knitted ribbing. The large hook size makes the project easy to manage and quick to work. 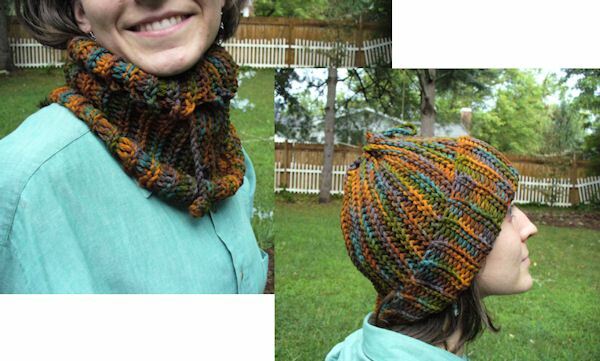 A child sized hat/neckwarmer is easy to make by using a K hook and sport weight yarn, following the same directions. Note: As with any drawstring, it’s important to avoid allowing child to choke him/herself! Insert hook into back loop of indicated stitch, yo and loosely pull through both loops on hook in one smooth motion. Note: It’s very important to work loosely! This stitch is quick and easy, once you “get it” about the necessary looseness! It’s also easy to “lose” the last stitch in the row, as it tends to “slouch” or lean toward the previous stitch, so it will be helpful to either count stitches in every row or to use a stitch marker in the last stitch, to indicate beginning of next row. If you have not yet worked in slip stitch crochet, you may want to practice a bit first with scrap yarn. Base Chain With P hook, ch 36 . Row 2 Ch 1, turn, slb in ea st across row. Row 3 Ch 5, turn, slb in first sl st and in each sl st across. The ch 5 will form a loop for the tie to be threaded through later. Rows 4-57 Repeat rows 2 and 3, alternately. Do not fasten off at end of row 57. Fold piece lengthwise and seam by slip stitching row 1 to row 57, working through one corresponding loop of each row. Fasten off. With J hook, ch 3, join with sl st to form a ring, work 9 sc in ring. Ch 78. Sl st in fourth ch from hook, forming a ring, ch 1, turn. Work 9 sc in ring, joining with sl st to first sc. Fasten off. Weave both ends in securely. Thread tie through the ch 5 rings on the hat. For hat, draw Tie tight and tie in a bow, forming top of hat crown. For neck warmer, untie, and loosen all the way, till the circles at the ends of the tie are touching the hat loops. 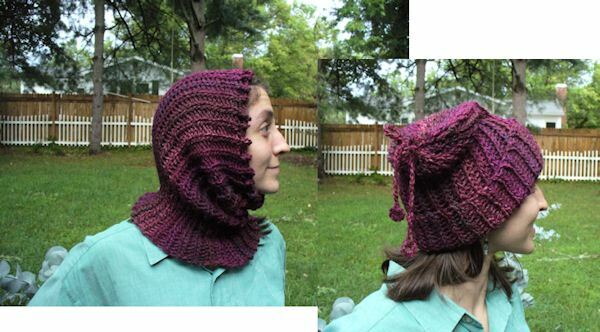 Pull over head, forming neck warmer, or pull just till your face comes through, forming cowl.